The Addison animal print home décor rug is an edgy and bold statement for any room – living room, dining room, bedroom, or entryway. Accented with blue and Green highlights, this contemporary leopard print design is sure to add sleek sophistication and panache and is the perfection expression of glamour and style. The Addison animal print rug is printed on 28 oz. Nylon cut pile with non-skid, latex backing – no additional rug pad needed. Durably constructed, this rug is washable for easy care. Made in the USA using the most advanced technology in printed rug manufacturing. This family owned company has been creating and manufacturing quality textiles for over 75 years. 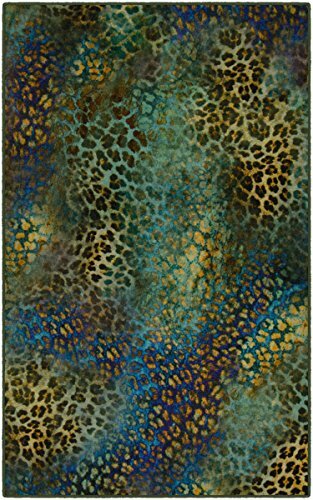 3'4" X 5' Decorative indoor area rug with colorful animal print, perfect for any living room, dining room, kitchen, bedroom, etc. View More In Area Rugs. If you have any questions about this product by Brumlow Mills, contact us by completing and submitting the form below. If you are looking for a specif part number, please include it with your message.